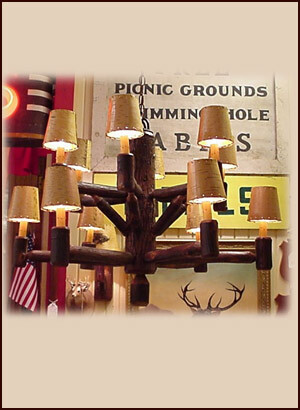 Inspired by a trip to Yellowstone’s Old Faithful Inn, our chandelier is constructed of tenoned hickory, can be ordered with or without hand laced birchbark shades. Shown in Walnut Stain. Shipped with canopy and 3 feet of chain.